For a host of reasons, including the sad fact that I have not yet learned how to bend time so I get more chances to read, I decided a while ago not to repeat last year's Blogging the Booker longlist effort. However, since the library at my work has all six of the shortlisted titles, I thought I'd take a look at some of them, both before & after the winner is announced later this month. The first to grab my attention was Patrick deWitt's The Sisters Brothers. Unusually for a Booker nominee, The Sisters Brothers is a very American novel. (The Booker, for those who don't track these things, is for Commonwealth writers. deWitt was born in British Columbia, hence his eligibility.) Indeed, it is that most American of genres, the Western. 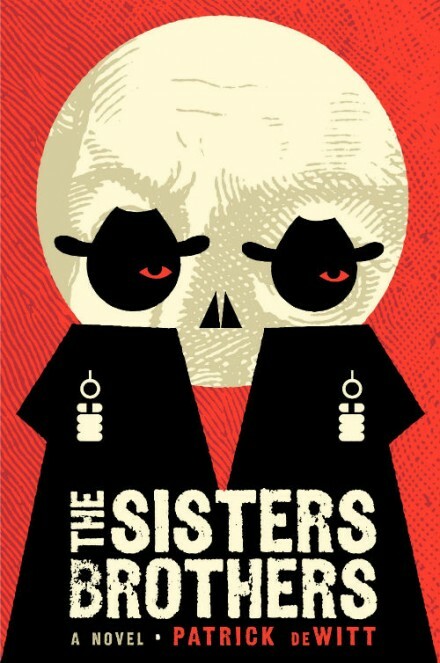 Falling somewhere in between True Grit (novel & 2010 movie; I can't speak for the original film version) and Deadwood (with the violence, without the swearing), The Sisters Brothers is the story of Eli & Charlie Sisters, two famous (in the world of the novel) assassins in 1850s Oregon. They work for a mysterious boss known as The Commodore, and the story begins with him sending them on a job to California, to kill a man named Hermann Kermit Warm, who has stolen something from him. Charlie, the leader of the two, is enthusiastic and violent; Eli, who narrates, is more passive, seemingly falling into his line of work because his brother did. Much of the book revolves around the doubts Eli increasingly has about making his living as a killer and the tensions between the two brothers. Yet despite all that, The Sisters Brothers is often quite funny, and both brothers are engaging company as we follow them from town to town on their trip to California. Like in the two comparison points I mentioned above, there is much enjoyment to be had in The Sisters Brothers by placing wildly different characters together and watching them interact. The two brothers, contrasting in many ways, have a fundamentally solid relationship nonetheless - a troubled one in many ways, but still with a core of genuine affection to it. And as with other revisionist Westerns, deWitt makes the most of highlighting small, everyday things as much as the actual story - including Eli's discovery, via a helpful dentist of the then-new practice of brushing one's teeth. He becomes a devotee, promoting the idea to his brother and others he meets, trying new flavours of toothpaste and remembering to brush regularly, regardless of what else is going on in his life. Once they get to California, of course, things take another turn, and the brothers begin to realise that there's more to the story between their employer and their prey than they had been told. Warm is another colourful character, and the last section of the book, while maintaining the brothers at its centre, becomes quite a different story in some ways. I thoroughly enjoyed The Sisters Brothers. deWitt has a fine ear for dialogue, and his narration, via Eli, is evocative and compelling. As a big fan of the revisionist-western genre, I found this novel an enjoyable and well-told addition to the field. As I noted last year in my Booker series, I don't always agree with the judges' choices for shortlist and winner, but I usually find at least a couple of books that I would probably have otherwise missed but end up being very glad to have read. The Sisters Brothers is an excellent example of that, and I hope its shortlisting brings many more readers to deWitt's wonderful novel. I like that you review such a wide range of books Joel - I don't think I've ever read a Western, but it sounds great. I may just have to pick up a copy. p.s. While variety is good, I request more DFW. If you take requests that is.